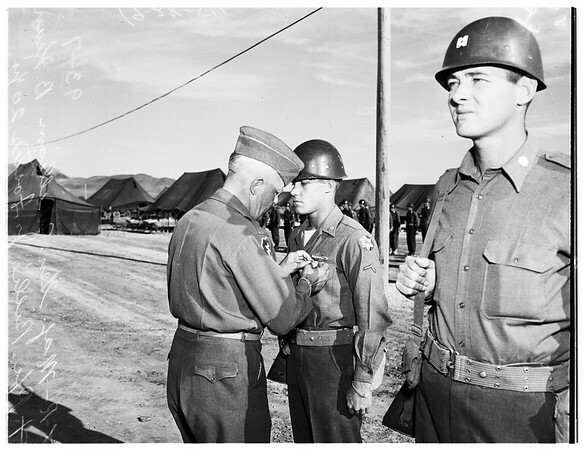 Bronze Star Medal...General pins medal on Private First Class, 1951. Caption slip reads: "Photographer: Sansone. Date: 1951-09-28. Reporter: Clausen. Assignment: Decorations. #53, 54: Maj. Gen. William B. Kean, Commanding Third Corps, pins Bronze Star Medal for heroism in Korea on PFC Billie J. Foster, 20, son of Mrs. Dale Crowl, 5120 Manhattan Place, Los Angeles".